A lot of people have reached out to us about this so we wanted to give a general idea of when our sitewide sales are. We have several recurring sitewide promotions each year. Few of these sales are attached to a firm date, but rather most slide a bit each year to suit both the international calendar and our internal marketing schedule. We also prefer to keep things flexible in case a delivery slips or we have a conflict or a last-minute change. Even if the precise dates might move around a bit within each month, here are some guidelines that can help you when setting your own release or promotion schedule. Early January: New Year, New Game occurs in the first half of January. It tends to focus on quickstarts, intro adventures, and “starter pack” bundles for game systems. Early March: GM's Day is one of our three biggest annual sales, with substantial discounts on a huge swath of titles. All of May: D&D Month — Throughout the month of May, we host Dungeons & Dragons-specific sales, including all editions. Late July: Christmas in July is another of our top three biggest annual sales. It usually starts the Thursday before July 25. All of September: Our September System/Setting Sales focus on one or two major game systems or settings for the entire month, with broad sales on all titles for that system or setting. Mid- to Late October: We generally hold a Halloween Sale in the mid- to latter part of the month. Usually the focus is on Horror titles of some kind. Early to Mid-December: Prior to Christmas, we hold the Teach Your Kids Holiday Sale. This promotion features child- and family-focused games only. I hope that your February is going fantastic! This is a quick update for print on demand books as we prepare for the following print cost changes in April. We do not have a definite date yet, but as we get closer, we will notify you as soon as possible. · Short books of all types will generally decrease substantially in cost as the fixed price for low page count books goes away. · B&W books will be 10-15% cheaper. · Standard Color books will be 10-35% more expensive. · Premium Color books will be 15-30% cheaper. There will no longer be a "Medium" size for Premium Color books. The 6"x9", 6.14"x9.21" sizes will now be considered small, and the 8.5"x8.5" size will now be considered large. The new cost formulas below apply to all available page counts. · Premium Color Landscape will have the same price as other Premium Large formats. · There will be no more Quantity Discounts for bulk orders over 50 copies. In April, when we update print costs for your POD books, we will adjust the site price on your titles automatically so as to maintain the margin you have set for that printed format. As part of this site price adjustment, we will try to maintain similar price points that still end with $X.95, $X.99, or $X.00 to stay as close as possible to the prices you have set currently. For example, if you have a 300-page, hardcover, premium color, 8.5x11” book on site now, the current print cost of that would be $39.90. After the April cost changes, the print cost will drop to $33.13. If you currently have the print margin on this title set to $20.09, then its site price to customers would be $39.90 + $20.09 = $59.99. With the April update, our code will first attempt to maintain your margin of $20.09, re-setting the site price initially to $33.13 (new print cost) + $20.09 = $53.22. As that site price does not match the format of your former site price ($59.99 follows the $X.99 format), then our code will adjust your margin from $20.09 to $20.86, so that your new site price becomes $33.13 + $20.86 = $53.99. Of course, after the April update, you are free to further adjust your margins (and resulting site prices). We think this automatic price reset is the easiest and most effective process for us and you. We welcome your feedback. What if I planned my KickStarter? Many KickStarters print runs may benefit from the cost reductions, but if you already planned on a larger (i.e., higher page count) standard color book, you may be facing a sizable cost increase. We will work with you on grandfathered pricing if your KickStarter launches on or before March 1st, 2019. If you are within that date range, please contact your Publisher Service Representative so we can work with you through your fulfillment. If you have any questions, please don't hesitate to reach out to me through e-mail during normal business hours. Gallant Knight Games and DriveThruRPG are pleased to announce a new community content program, centered on the TinyD6 ruleset: Tiny Trove! The minimalist TinyD6 ruleset has been a hit since it’s launch, and now fans can create their own content centered around Tiny Dungeon 2e! Now, Gallant Knight Games and DriveThruRPG have partnered to let independent content creators publish material utilizing the TinyD6 ruleset and set in the top quality variety micro-settings published in TinyD6 products! · Additional content supporting other TinyD6 game lines will roll out beginning with Tiny Frontiers: Revised in May, 2019 and continuing forward. When this happened, why did you not suspend sale of Zak’s titles while you deliberated?When we expect that it will take us a few days to deliberate on a title reported for offensive content, our policy is to temporarily suspend sales of that title. In this case, though, it was not the content of any particular title under discussion, and we did not find any titles where we directly paid Zak for ongoing sales during our deliberation. 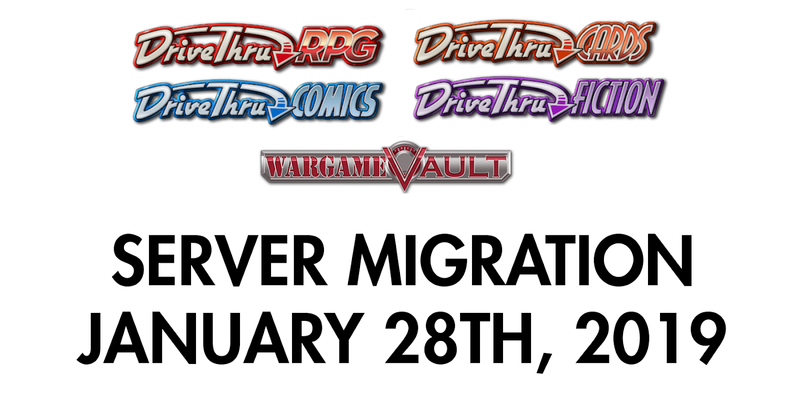 Monday, January 28th! Please mark your calendars! The site could be down for 12 hours while our tech team migrates from our dedicated servers to the cloud. After the server transition, DNS propagation time will determine how quickly people can reconnect to the site. New Year | New Game Sale! 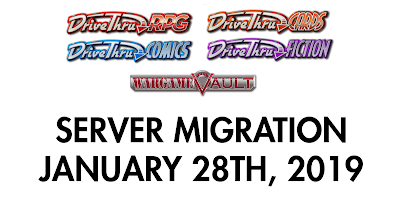 Our New Year | New Game Sale is underway on DriveThruRPG.com, DriveThruCards.com, and DMsGuild! Feel free to use the following banners to promote your titles on your social media platforms or newsletters. This sale is from January 3rd - January 14th, 2019. We ask that publishers do not use the Send Customer E-Mail tool until next week as we are sending the Newsletter today and want to give the sale some breathing room. If you would like to track your click-throughs, don't forget to check out our Marketing Analysis here to add on an SRC (source code) to the end of your link. If you have an affiliate account with us, do not forget to utilize that link in your promotions as well. If you're not an affiliate with us already, please check out our Affiliate System. If you are not in the sale but would like to run your own, we encourage you to do so through the Manage Sales option. We use specific filters to find titles for the sale and all publishers in the sale are Opted In to our site-wide sales. You can change this through the Opt-Out Opt-In Tool. This is a good time, too, to make sure your titles are properly filtered into the correct category. DriveThruRPG.com has six deeply discounted bundles as well as thousands of titles on sale. All Tier 1 adventures are on sale at DMsGuild.com as well as a few surprises! Tons of amazing titles are available at discounted prices at DriveThruCards.com!